We arrived late in the evening but check in was simple. The bed was really comfortable and the room was clean. Very good and just what we needed for a stopover. Stayed with colleagues in separate rooms and all were unified in their opinion that this is a truly value for money proposition. Clean, a good bed and the option to have dinner and a drink onsite, what more do you need for a one night stop-over. Price point is good. Value for cost with last minute booking. Clean. The location happened to be perfect for us. Also, there was some large shops in 5min drive, which was very nice surprise. The sleep quality was good and bed was large and comfy. What else do you need for a quick rest between long drive? the receptionist when we arrived was great - very helpful. The lady at the breakfast was fantastically friendly. Unfortunately that is the only positive I can think of. Pay that extra 5 euro and go to a campanile or ibis budget - this place really isn’t worth your time or money, even if it is cheap! Breakfast was fantastic value. Great coffee and delicious croissants etc. Fasthotel Reims-Taissy in Taissy is a hotel with a garden and a terrace. The property features a bar, as well as a restaurant serving French cuisine. Each room is equipped with a flat-screen TV with satellite channels. Free WiFi is available throughout the property. At the hotel, rooms come with a desk. The private bathroom is fitted with free toiletries. All guest rooms have a wardrobe. Reims is 3.7 mi from Fasthotel Reims-Taissy, while Épernay is 13 mi from the property. Châlons Vatry Airport is 31 mi away. This property also has one of the top-rated locations in Taissy! Guests are happier about it compared to other properties in the area. 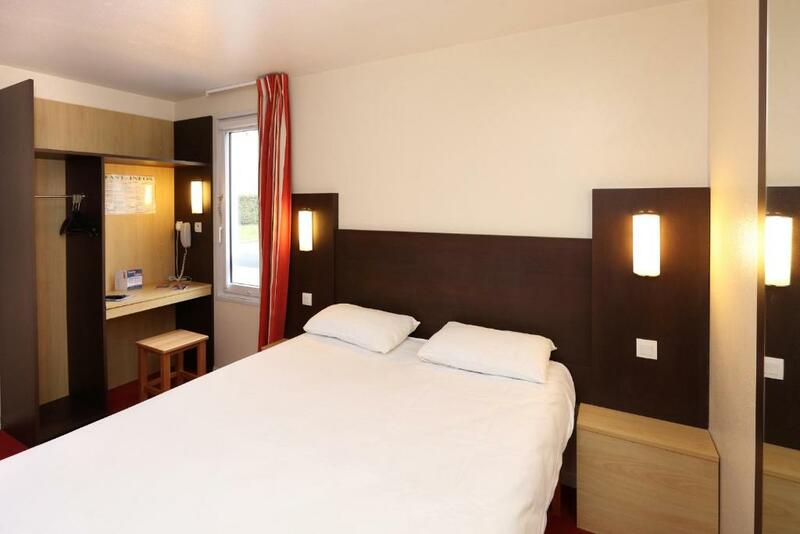 When would you like to stay at Fasthotel Reims-Taissy? With free Wi-Fi access, this room has a TV, telephone and a private bathroom. House Rules Fasthotel Reims-Taissy takes special requests – add in the next step! Fasthotel Reims-Taissy accepts these cards and reserves the right to temporarily hold an amount prior to arrival. On Sundays and on bank holidays, reception is open from 08:00 to 13:00. After 13:00, keys can be collected from the check-in machine. On weekdays the reception is open from 08:00 to 20:00. Guests arriving outside opening hours can retrieve their room key via the automatic key dispenser, using their Booking number and credit card. Please note that the restaurant is closed on Friday evening, Saturday and Sunday. Please note that the restaurant will be closed from 6 to 26 August 2018 included. Smelly bathroom - sewage galore. Noisy room - could hear the neigbour snore. Noise from fighting people on the street (not the best area...?). Weary room - nasty carpet, shower curtain (really?). The bed - I don’t even have words for this and doubt it could be called a bed. It was so worn that it had the shape of a half moon, and was put on a wooden board (not an actual bed). Walls a bit thin so it was disturbing when people arrived late at night. No security on car park. Our fault not realising. We usually stopover somewhere that has a secure car park as car is packed up! All safe though. Think of room as more like a caravan and you’ll be fine. All very clean and peaceful so it worked for us. Additional pillows, tea and coffee in tea in the room. We didn’t have breakfast, it was exactly what we were looking for as an overnight stop on the way to the Alps. Clean and worm room. Big parking place. Good value for money, friendly staff. Good and fresh coffee. Room smelled strongly of cigarettes. Convenient location. Helpful women staff member even though arrived late. The only thIng unfortunately I found I didn’t like was the fact that I was parked at the end of the car park and in the morning manovered forward and turned left out of the car park and damaged the sill on the left side of my car which is now going to cost a lot of money to repair . I don’t really see a purpose for these low bollards which cannot be seen from the drivers side in a right handed side drive. The room was clean and we had clean towels every day . The reception staff and chef were helpful . Breakfast was value for money . The rooms were comfortable for our expectations. The environment was Quiet , no noise from the road which was good . Hotel is located in an area where offices and other compagnies are situaties. Good location, small drive to city centre and motorway. Perfect one night stop over hotel! Restaurant not open at the weekends!